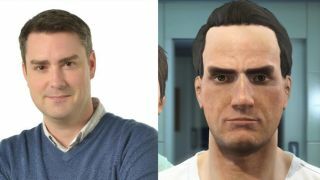 How hard is it to create yourself in Fallout 4? Fallout 4 is here, and we bet you can't wait to burn all your precious hours perfecting eyebrows and cheekbones before arriving on something that looks vaguely like yourself and then loading up Halo 5. Not really - beyond the character creator is a wonderful game waiting to be played, you can read our thoughts on it here. But just how uncanny can your nuclear survivor be? It certainly isn't The Sims, but the tools do allow for a fair amount of customisation. You could spend hours on this part of the game just tweaking and prodding your face to the closest possible likeness, but you should know that you do get another chance to change your appearance later when exiting Vault 111 for the first time. We had a go at making ourselves - some worked, some... didn't.